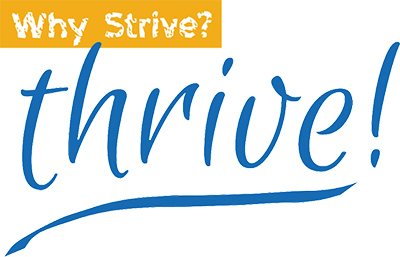 Survey | Why Strive? Thrive! Thank you for taking a few moments to answer a few questions. Don’t think too hard. There aren’t any right or wrong answers. This is designed to help you think about areas where you may be stuck in your life, and helps get the conversation started. What would you like to achieve by working with a coach? Coaching may require you to address one or more of the items below. What areas do you struggle with? Are you ready to step into a coaching process that can transform your life? Yes! I’m eager to get started. Yes. I’d like to receive coaching, but I’m not sure the timing is right. I’m not sure. I want to think about it more. Thank you so much for your time and interest. If you answered yes, I will be in touch! If you aren’t sure and want to think about it, sign up for my weekly email Thriving Thursday just below this form. Thriving Thursday is a blog that sparks reflection, asks questions and provides quick tips.